The Italian hill village of Cortona is a magical place that grabs hold of your heart and refuses to let go. I am very fortunate to have done a good bit of traveling and have seen some truly beautiful places. Given that, I have to say that Cortona, Italy is one of my very favorite places. My husband and I intended to only visit Cortona for a day, as we were staying in an Agritourismo (bed and breakfast) in Tuscan countryside but after only a few hours, we altered our plans and set up camp in Cortona. 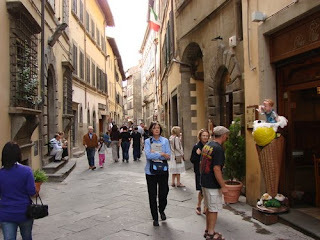 Cortona is small enough that a visitor can easily become a part of the daily flow of life, which we did and loved. Take a stroll and grab the best tasting sandwich and farro salad from Molesini market. Later, visit Emma and Richard at Bar 500 for a campari and soda and don't be surprised when they graciously provide some nibbles. The nighttime ritual in Cortona is to walk the Via Nazionale, the main street through town, which is narrow and usually features only pedestrians. You will walk beside village elders, the shop dog Bruno (he is a charming pug full of personality), the pharmacist and other local color all doing what they do every single day- taking their daily stroll. I will post my Best of the Best list for this jewel of a city soon but for now, enjoy these beautiful views. This entry was posted on 7:05 AM and is filed under Cortona , Italy , Via Nazionale Cortona . You can follow any responses to this entry through the RSS 2.0 feed. You can leave a response, or trackback from your own site. My husband and I were suppose to go to Italy for our honeymoon but we didn't go because his mom was in hospice. I would love to get there! When we do, I'll visit this town. Its lovely! Am going To Italy next week. How far from Florence is this? it does looks magical, love italy, i hope i can go there sometime. it shurely seems like a great place to travel. That is so beautiful! I love those photos and it sounds like such a great non-touristy-trap place to travel! That is such a beautiful location! I would love to go visit. Cannot wait for the best of the best list! ohh my goodness. i love italy so much. venice is the first place i ever set foot out of the country, and i fell in love. such a beautiful, magical country. Sounds lovely! Can't wait to see more. Sigh .... I've got itchy feet! I love Italy too and can't wait to see the rest of the list. Interesting place. You should make more pictures. Looks so wonderful. Looking forward to your best of the best! I have never been there, but seems like an awesome place! Hi David Toms! I apologize for just now getting back to you. It is only about an hour by train from Florence to Cortona. Just take the Rome-Florence line from Santa Maria Novella and get off at the Camucia-Cortona station. Cortona is about 3 miles away and buses run every 30 minutes from the station to Cortona. I do hope that you are able to visit Cortona, I know that you will love it! Please don't hesitate to get in touch if you should have any other questions. I would love to hear about your trip when you return. Wishing you safe and happy travels. The art school at UGA has a study abroad program in Cortona. Have heard FABuLOUS things about the city, but have not been. However, I don't have a graduate degree yet, do you? Sounds like a good excuse to me!